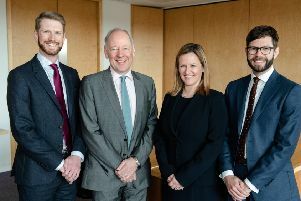 Law firm Anderson Strathern has bolstered its team in Edinburgh by hiring the former head of rival DWF’s Scottish private client practice. Anne Henderson, who has more than 20 years’ experience of advising well-heeled clients in areas such as asset protection and inheritance tax planning, joins as the firm plans more appointments in an arena where the likes of Turcan Connell and Brodies are seen as key rivals. As well as bringing in two more qualified solicitors to its 50-strong private client team by the end of the year, Anderson Strathern is aiming to scale up its office in Glasgow to match its presence in Edinburgh. He said the investment in the practice is aimed at addressing a growing demand for legal and wealth management advice, steering clients through the law of succession, inheritance of pension pots, tax treatment of investment income and savings and the needs of the elderly. Meanwhile, the prospect of further devolution for Scotland is “exercising the minds” of many families and trustees, Henderson said. Anderson Strathern, led by managing partner Murray McCall, recently reported an 8 per cent rise in first-half revenues to £10.5 million, with profits per partner up 13 per cent. The firm, which also has an off­ice in Haddington, said it had attracted “significant” client wins across the commercial and public sectors.